Maria Montoya Martinez (1887 – July 20, 1980) was a San Ildefonso Pueblo pottery artist who created internationally known pottery. 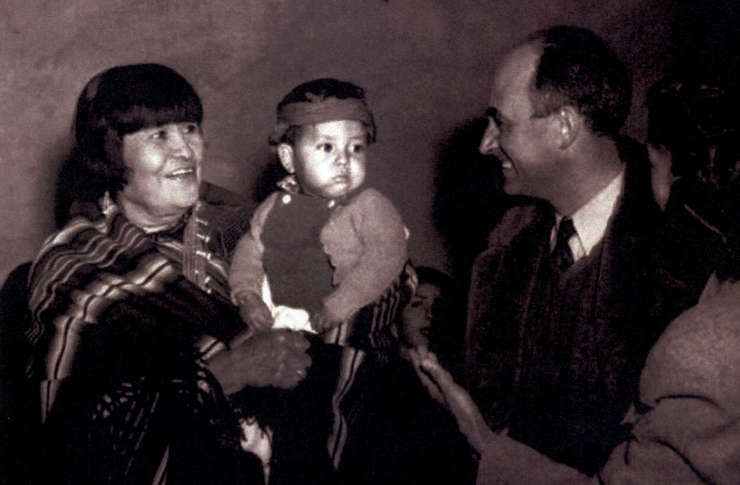 Martinez (born Maria Antonia Montoya) with her husband Julian and other family members researched traditional Pueblo pottery styles and techniques to create pieces reflective of the Pueblo people’s legacy of fine artwork and crafts. Edgar Lee Hewitt was leading an archaeological expedition at Bandelier National Monument in New Mexico in 1908. His workers found shards of polished jet black pottery and Hewitt went looking for a potter to recreate that. He wanted to go to descendants of the Bandelier people and that meant San Ildefonso. So he inquired after a potter who was profiecient enough to be able to recreate that black pottery and everyone he spoke to pointed at Maria. So he went to Maria and worked out an arrangement where he paid her in advance to produce a number of black pots that were also made in styles very close to what he'd found in the dig. Maria and Julian experimented with a number of different clays, tempering agents and firing methods but nothing was producing the results she wanted. Sarafina Tafoya of Santa Clara Pueblo was still making pottery the ancient way and she showed them a method of smothering the fire at a certain point during firing that caused a vacuum induction process that trapped the smoke and essentially carbonized the clay surfaces of the pots, turning everything black. Maria also learned several polishing and burnishing tips from Sarafina. She delivered a few black pots to Hewitt in 1913, then hid the rest away. She wasn't happy with the quality of them until Hewitt brought some guests to Maria's home several years later and they were primarily interested in her black pots. That was when she decided to perfect her process for making them. Julian also spent several years developing a process for decorating the pots in which the pot is burnished first, then a matte background added. Between her ability to make the pots and her husband Julian's ability to decorate them, Maria became world-famous and is attributed with resuscitating Pueblo pottery as an art form. Maria also spent half her life teaching others to make pottery her way. In the early days, none of the pueblo artists ever signed their work as no one ever expected to become famous or have their name add value to their creations. Maria is attributed with the first signature on a pot, "Marie" in 1923. As much as her husband contributed greatly to the process, the making of pottery was not a man's thing in the pueblo so she left his name off until 1925 when the signature changed to "Marie + Julian". The signature changed again after Julian died in 1943. Maria's son Adam took over Julian's chores of gathering the clay and painting the decorations while his wife Santana helped Maria coil, polish and fire the pots. Santana painted a lot of pottery, too, during this time. The signature became "Marie + Santana" until 1954. In 1950 Maria invited her son Popovi Da into the circle as he was a successful watercolor painter and she felt he might take over what had been his father's job in her business. Adam taught him how to collect and prepare the clay, Santana taught him the painting techniques she'd learned from Julian. Around 1956 she changed "Marie" to "Maria" and began working with Popovi Da while Adam and Santana became established potters under their own names. In 1959 the signature on Maria's pots became "Maria + Poveka" or "Maria/Popovi". Maria traveled the world demonstrating her processes and selling her pottery. She met every man who was President during her adult years and taught many, many people how to make Pueblo pottery the traditional way. At this point in time, she is the Matriarch of a five-generation Martinez dynasty in the pottery world. And she always attributed a lot of what she knew to Sarafina Tafoya of Santa Clara Pueblo, Matriarch of the eight-generation Tafoya dynasty.